Lighting Research Laboratory, General Electric Company, Nela Park, Cleveland, and Aluminum Company of America, New Kensington, Pa.
Spectral sensitivity of fluorescent photometer for measuring ultraviolet reflection-factors. 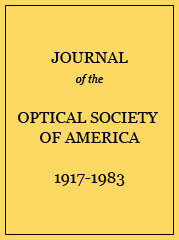 Diffuse reflection-factors for light, relative diffuse reflection-factors for ultraviolet (see text), and diffuse reflection-factors at λ2967 for various specimens of aluminum. Hydrofluoric acid etch—Specimens A-1 to A-8 and D-1 to D-8.Sodium hydroxide-sodium fluoride etch—Specimens AX-1/2 to AX-2 and DX-1/2 to DX-2.Sodium hydroxide-sodium chloride:hydrofluoric acid etch—Specimens ANF and DNF.All samples marked A and D were from two different lots of aluminum sheet (2S), and the number after the letters indicates the number of minutes the specimen was immersed in the etching reagent, hydrofluoric acid, for example.